Don’t waste Rebel on dot ORG since LCN is cheaper standard $6.19. Rebel is only place to have ever offered CO deals to best of my knowledge. The transfer promotion is 10 total transfers per client. Domain registrations are up to 40 new .CA domains, other domain extensions are limit 10 per client. The goal is JUST to get the coupons for now – you will have 48 hours to use the coupon, so my plan is to get the coupons every hour, then tomorrow, can sort through and decide what to use, find domains to reg/transfer etc. Edit – they lied – if the deal is exactly the same as a previous deal, like com net org transfer – Sorry, you can’t claim this coupon, because you’ve already claimed something in the same deal group. 4] As soon as you see the orange “Get Your Coupon” button on the right hand side CLICK that button to claim! Also have a IRL timer set for five minutes before to be certain to avoid getting distracted! 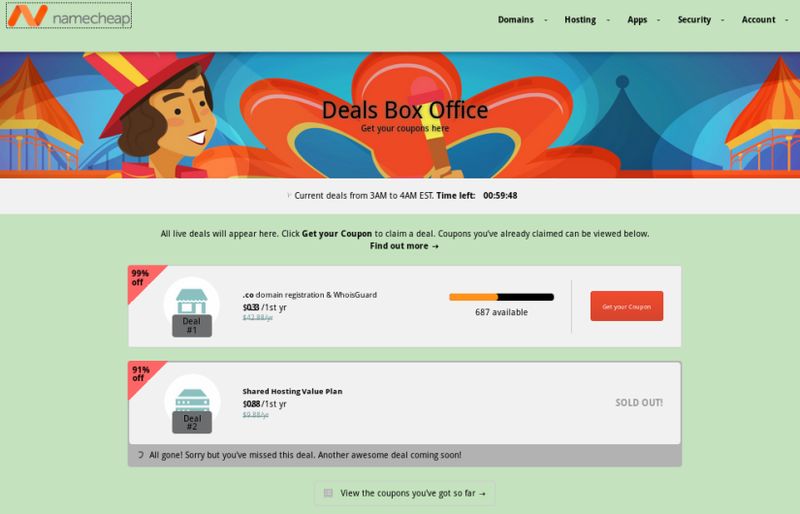 Some of the deals have SOLD OUT in less than one minute, depending on the offer and the limit for that deal. You *might* run into a captcha – my theory is if you have been logged in continuously since the sale started it might think you wrote a script, so MAYBE if you log out and log back in every hour that could prevent it – that’s a total guess worth trying anyway. *Hourly coupons are issued for every unique deal and customers can buy 1 item in each deal. *Coupons are limited to one business/household per day for each unique deal. UNX saved $25 for 15 minutes effort, if bulk transfer was working would have taken 5 minutes, you be the judge of what your time is worth! Note: This is ONLY if you are doing enough transfers to meet the $60 minimum for 25% off. If you just want to do 15%, see bottom for much easier method. This sets up a NEW account and uses one of the domains you enter randomly as the new username. Mine happened to be the last domain I entered yet that may not be how it chooses. Because they have so many issues, I have asked support before if they care if you have multiple accounts and they do NOT as long as you are not abusing the affiliate program or doing it to use a coupon over the limit. After I get all the domains processed, I have support remove them and I push to myself at another account. So far I have not run into abuse issues with multiple accounts, my plan was to download billing histories and close unused accounts, haven’t gotten to it yet though. I have a total of 10 now – 2 domain, 3 mydomain, 3 netfirms and 2 dotster. 1] DO NOT LOG IN! 5] You will then be on the cart page and should see the transfer with extension and price. 17] The bulk Verify Credits STILL does NOT work, so go to Domain Central and enter Auth Codes for each individual domain, when you “Verify Credit” it will automatically process the already purchased credit. The transfers themselves took a few hours to complete from Dynadot, which has an instant transfer approval. Losing registrars that have standard 5-7 day wait transfers are in process, as long as the domain shows it used a transfer credit in the Billing Manager and is “In Progress” you will be fine. If you just want to do a single transfer or a couple transfers for the lower 15% coupon SAVE01 WITHOUT the minimum, then you can use your existing account, in Domain Central “Add Domain” to enter the domain to be transferred, enter the Auth Code, and you will have only a single domain in cart to checkout. If you back out and try to add another, it will forget the cart already in progress. The 15% code has NO minimum, so you could just use it a few times. Feel free to ask any questions or clarifications on NamePros, I just didn’t want to sidetrack the thread with a questionable method. Plus here I have unlimited editing time in case there are updates.